M. M. Krishan -Galgamuwa Group Corr. At present, many activities are being carried out for the benefit of Buddhism and the Buddha Sasana in the country. The spread of Buddhism which started over 2,560 years ago, was successful as a result of the efforts of Buddhists all over the world to take forward the message of the Buddha. Dhamma talks and other acts helped spread the message to every corner of the world and the country. 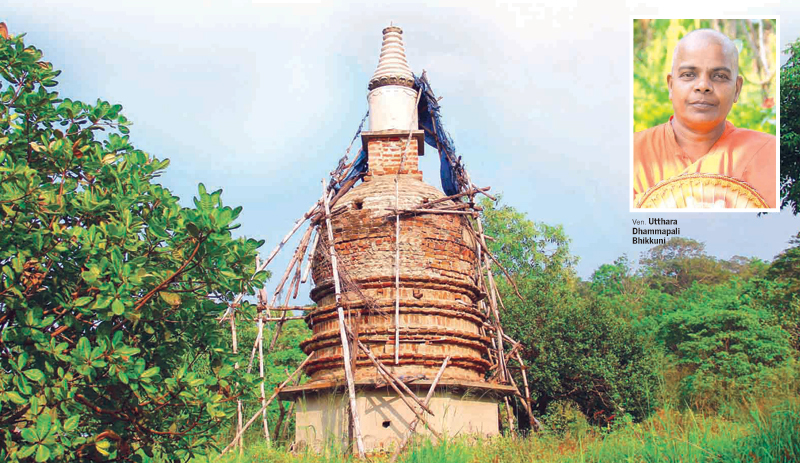 And to protect Buddhism, those in Sri Lanka built various temples and monuments. Monks also went to all corners of the island for this purpose. However, the most remote parts of the island do not receive the same attention as those in urban areas; they receive the same treatment as other development priorities in these areas. Temples in urban areas are rich and well-funded, whilst those in poorer areas struggle to complete basic construction. The only support they receive is the hard labour of the people. The situation of the Bhikkus and Bhikkunis who survive on these temples are even worse. The Galkiriyagama mountain range is known as the longest mountain range in Sri Lanka, and it is surrounded by the Kahalla Palle Forest Reserve. However, the small temple which has been built in this scenic place is not that scenic. In the Kurunegala District, Polpithigama Divisional Secretariat belongs the No. 344 Ihala Thimbiriyawa Grama Niladhari division where the village Ranamukgama is situated. And this small village is home to the Dhammapali Aramaya. It was established nine years ago with the planting of a small Bo tree and a statue of the Buddha next to a small half-built room as the Aramaya. Ven. Utthara Dhammapali Bhikkuni is the main and only prelate here. For nine years, she has struggled to complete the construction of her Aramaya. At times, she is helped by a few who come to visit her Aramaya and at times, she has to travel long distances to find the money needed for it. Her passion and determination to complete it however has kept her going, despite the odds. “It took me nine years to get here. In those nine years, the soles of my feet wore out to the core. Even though it is my Aramaya, I would walk from village to village collecting money for this, so I could return and build a bit more. Apart from that, when I am invited to deliver a sermon, the people give me some money, so I used those funds too to build the Aramaya,” she said. Ven. 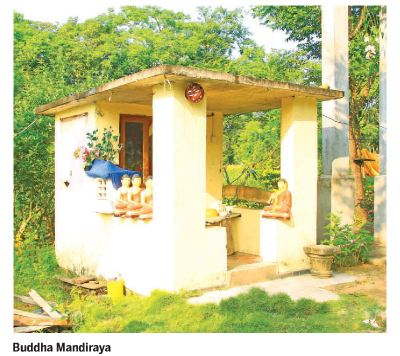 Dhammapali came to this area in 2011, and initially, when she set up the Aramaya, a few devotees from the village would visit. However, due to pressure from certain groups, they too stopped coming. “But I was determined to keep the Aramaya going. My aim is to save even Rs. 2 and complete the Aramaya,” she said. At present, there is a half-built Bodhi Prakaraya, a half constructed Chaithya Rajayanan Vahanse and a small chamber in which the Bhikkuni resides. In 2014, Ven. Dhammapali was fully ordained and thereafter, she was able to preside over her own Aramaya. “I started work on the Bodhi Prakaraya with what I could do, but I have not been able to build it as properly as I would wish. I used the money I collect from house to house, village to village. I buy the cement, a few bricks and even the sand from the money I collect as alms. Even the cost of labour has gone up tremendously. I need to pay a carpenter Rs. 2.000 a day and a labourer Rs. 1,500 per day. When I don’t have money to pay the labourer’s charges, I take on his job, and carry the buckets of cement myself. It is with this struggle that I am trying to build this Aramaya,” she said. The Bhikkuni at times has to even cook them lunch in order to get them to do a full day’s work. The Aramaya is a lonely place, despite its tranquility. From morning to night, she would sit there on her own with none to aid her. Thus all work including her own is done by her. The statues needed for the Bodhi Prakaraya however have already been brought to the Aramaya, but as the Prakaraya is not complete, the statues are slowly deteriorating. At the same time, the building of the Chaithya Rajayanan has been temporarily suspended. The building of Chaithya Rajayanan was begun in 2015, but due to certain financial difficulties faced by the donors who agreed to build it, work on it was stopped. When millions are being spent on lavish temples around the island, the Bhikkuni is finding it difficult to collect just a fraction to complete her small Aramaya. She takes on the risk of living in the middle of nowhere among the elephants simply to fulfil this dream of hers. Whilst it may not be as famous as the great temples in the island, this contribution of hers to the future generations of Buddhists must be appreciated.